I used to love stopping by Panera Bread in New York . 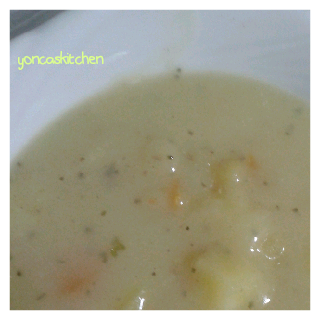 Especially winter time and having their yummy creamy potato soup. 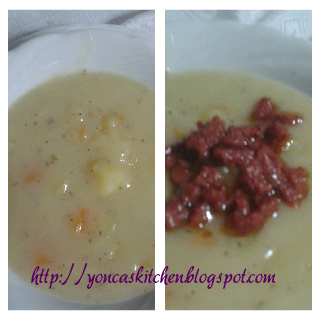 Last week I came up with my own version of this soup:) I believe that the carrot gave extra benefit and taste to it. Combine chicken broth, potatoes, carrot cubes and spices in a small pot. Boil until potatoes and carrots are tender. If you like your soup smooth, here is a little tip: Smash some potato cubes for thickening. Add cream cheese. Keep stirring until the cheese melts. Ready to serve. Sprinkle a little pepperoni or bacon over each bowl of soup. Extra pepperoni this time for Aria!! !